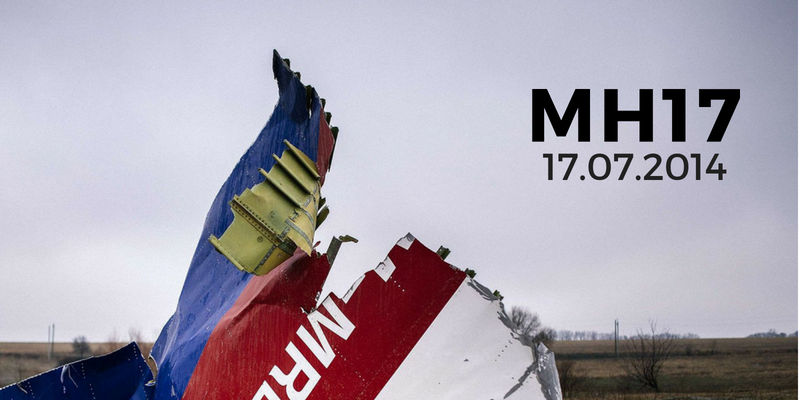 On July 17 2014, Malaysia Airlines Flight МН17, Boeing 777, on its way from Amsterdam to Kuala-Lumpur, was shot down in the vicinity of Grabovo village, close to the town of Torez, in Donetsk region, Ukraine. All 298 people on board died in the crash. 196 of them were nationals of the Netherlands, the others – people from Australia, Belgium, Canada, Germany, Indonesia, Ireland, Israel, Italy, Malaysia, New Zealand, Philippines, Romania, South African Republic, Vietnam, Great Britain and the USA. 80 of the passengers were children, three of them babies. By number of victims, the downing of MH17 was the worst air accident since 11 of September, 2001, and one of ten biggest air accidents in history. In this material, UCMC takes a look on the latest evidence about Russia’s role in the disaster and the questions which still remain unanswered. G7 Statements: Moscow must be held accountable On July 15, G7 Foreign Ministers published their common statement on MH17 at the website of the Government of Canada, which heads the G7 at present. In the statement, they call Moscow “to account for its role in this incident and to cooperate fully with the process to establish the truth and achieve justice for the victims”. G7 added that according to international legislation, those responsible for the firing or launching of the BUK missile must be brought to account. Conclusions of the Joint Investigation Team: Russian “BUK”. In May 2018, the Joint Investigation Team (JIT), which conducts official investigation of the tragedy, announced that the missile system “BUK”, which was used to shoot down the plane, belonged to the 53rd Anti-Aircraft Missile Brigade of the Armed Forces of Russia, based in Kursk. The JIT representative explained that the very same missile system could be identified by a number of particular features, in particular missile’s serial number, using photo- and video evidence from various sources, including social networks. “These characteristics are a kind of “fingerprints” of a missile system,” explained Wilbert Paulissen, Head of Central Crime Investigation Department of the Dutch National Police. “All vehicles in the convoy which accompanied the missile system were vehicles of Russian Armed Forces,” he added. 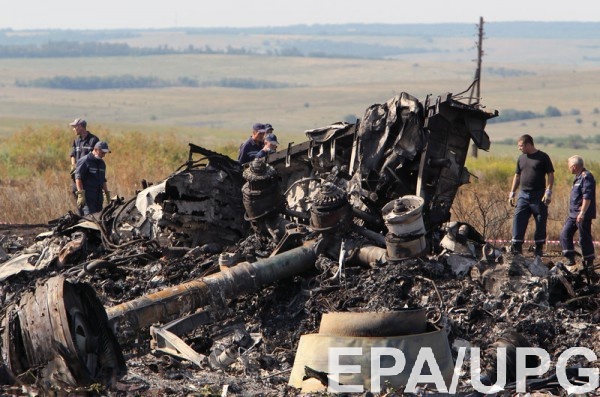 Conclusions of the Joint Investigation Team: names of those guilty The JIT has a list of individuals suspect of taking part in transportation of the “BUK” missile from Russia to Donbas, and those who could have launched the missile, but their names had not been disclosed officially. The investigation team said they have identified with a high degree of certainty one of suspects, known as “Andei Ivanovich” or “Orion”. The investigators suppose that this person is Mr. Oleg Ivannikov, currently a member of Russian military’s Intelligence Directorate, “GRU”. 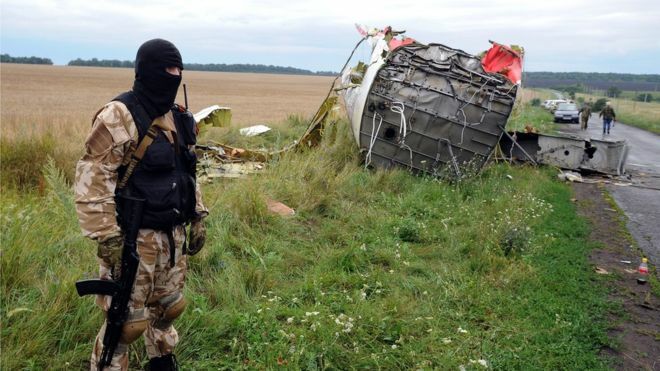 According to investigators, Mr. Ivannikov was responsible for coordination of pro-Russian militants in Luhansk region, as well as private military company known as “Wagner Group” in 2014-2015, including July 2014, when the “Malaysian Airlines” flight was shot down. Bellingcat Investigation. Bellingcat experts identified one more suspect, reserve Colonel General of Russian Armed Forces, mentioned under pseudonym “Delfin”. In 2015, Bellingcat experts analyzed photos, videos and satellite images and announced that the “BUK” missile system which fired at MH17 was brought from Russia and then carried back immediately after the incident. Later, Bellingcat provided more precise details in a number of reports, noting that the “BUK” was from Kursk-based Anti-Aircraft Missile Brigade. What was the reason for shooting down МН17? Step by step, the investigators found answers to the majority of questions about the tragedy. The only one remains unanswered: what was the reason for shooting down the plane. A version which is likely to be close to the truth is one suggested by former Head of Ukraine’s Security Service Valentyn Nalyvaichenko. 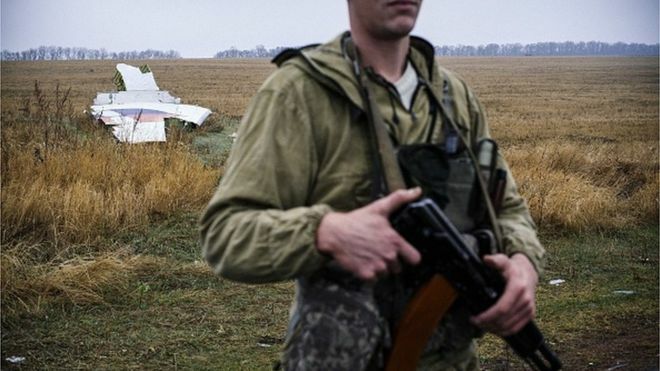 According to Nalyvaichenko, Russia-backed militants initially intended to shoot down a Russian civilian aircraft, “Aeroflot”’s flight Moskow-Larnaka, which was in sky over Donbas almost at the same time. The tragedy then should have been used to accuse Ukraine of a terrorist attack and should have become a pretext for full-scale attack of Russian regular forces. On July 18 2014, Ukraine’s Security Service published an audio of intercepted conversations between Russian soldiers carrying the missile. In the conversation, they mentioned that the “BUK” was situated near Pervomaiskoye village, where it had to shoot down a civilian aircraft. However, Russian servicemen responsible for the “BUK” did not know that there are three villages called “Pervomaiskoye” in Donetsk region. They were supposed to get to Pervomaiskoye to the west from Donetsk, where the Russian civilian aircraft was crossing the sky. Instead, they went to another Pervomaiskoye, to the south-east from Donetsk and, as a result, shoot down “Malaysian Airlines” plane instead. Russia’s comments. 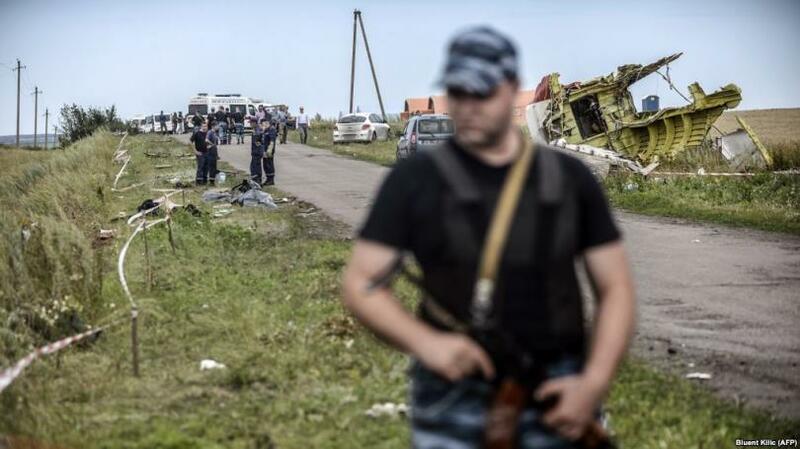 Russia has consistently denied any role in the downing of the plane. In 2014, Russian media offered a number of versions. Russia’s Ministry of Defense and military concern “Almaz-Antei” which produces “BUK” missiles affirmed that the missile was launched from the territory controlled by Ukrainian army. Meanwhile Russia’s Investigation Committee opened a criminal case on the incident and announced that a priority version for them is that the plane was shot down by Ukrainian military aircraft Su-25. Various experts affirmed that the latter was impossible, because Su-25 cannot fly at that height and cannot carry missiles which would be able to shoot down a plane on a 10 km altitude. In the beginning of summer in 2018, Russian president Vladimir Putin in his interview to Austrian TV & radio ORF once again repelled the accusation that Russia had had any role in the incident. According to him, both sides of the conflict in Donbas use weapons produced in former USSR and Russia. Where and when the case will be brought to court? The investigation is coming to its end, then the case will be brought to court. In 2015, five countries-participants of the investigation on the downing of MH17 called to create an international tribunal on the tragedy. Malaysia, the owner of the plane, Ukraine, the country where it was shot down, and home countries of the victims – the Netherlands, Australia and Belgium, approved the idea. At UN Security Council on July 29, 2015, Russia became the only country to veto the UN Resolution on creation of the international tribunal on MH17. The international agreement signed by the Netherlands and Ukraine and approved by the Netherlands Parliament establishes that the court proceedings will take place in the Netherlands, most likely in the Hague. Where the sentence will be enforced? On June 12 2018, the Dutch Parliament approved the agreement previously signed between the Netherlands and Ukraine. According to the document, the sentence on the downing of MH17 can be enforced in Ukraine; the court can use video connection when analyzing cases of the accused. If those convicted by the Dutch court will not be given out to the Netherlands, the sentence can be enforced in Ukraine.